Nike’s decision to use Flyknit on the upper might have worked because many wearers commented that the Nike React Hyperdunk 2017 Flyknit really feels comfortable. This is why users are a llittle disappointed that Nike did not implement Flyknit on the tenth-anniversary model of the Nike Hyperdunk line. The majority of reviewers express their willingness to recommend this product to friends and family who also love to play basketball. Some reviewers say that the React technology used on these Nike basketball shoes provides the expected level of responsiveness and cushioning, saving the wearer time and a lot of energy. A good number of wearers give this shoe model high overall satisfaction scores. Some reviewers just love how this high-top basketball shoe looks, saying that it boosts their confidence on and off the court. A lot of wearers just love the traction of this model from Nike. It is as good as Chris Paul’s 11th signature shoe. There were a few reviewers who mention that the Nike React Hyperdunk 2017 Flyknit needs time to break in. A few of those who left comments say that these Nike shoes run smaller than expected, so new buyers are advised to go at least half a size larger. The Nike React Hyperdunk 2017 Flyknit is definitely not one of the cheapest basketball shoes on the shelves today, but the price is easily justified by the goodness that it brings. Some wearers notice that this model provides just the right amount of responsiveness, enhancing their running efficiency and their overall performance in the game. The Flyknit technology used on the upper is said to provide high levels of comfort. When it comes to style, this shoe does not fall short because there are buyers who love how this React Hyperdunk 2017 Flyknit looks on their feet. Overall, this is a really good hoop shoe. From the traction to the materials to the lockdown. Support is OK at times. You know, like I said, your foot might roll over the footbed if your going 500mi/hr, but overall, I have got to say everything on this shoe is pretty solid. I love the feelings of the materials -nice and soft. Traction is on point, lockdown - secure. 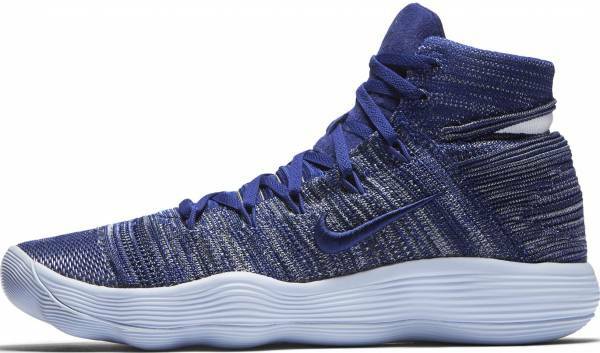 Better traction than previous Hyperdunks, better cushioning than the 2012-14 version, great fit, good stability and excellent containment… what more do you want? For those who aren’t looking for BOOST level bounce, the 2017 Hyperdunk Flyknit got you covered in ALL performance aspects, no matter the player or playstyle. With nine years of history behind it, the 2017 version of the Hyperdunk debuted on the feet of Golden State Warriors player Draymond Green in June. This release from the Hyperdunk line features the newly developed React technology that provides a springy response to even moderate amounts of energy inputs. To provide high levels of comfort, the upper uses the Flyknit technology that is said to hug the foot like a sock. Stability and safety is ensured by the shoe model’s use of a well-thought-of traction pattern that maps and supports the foot’s major pressure points. Responsiveness. The Nike React technology is among the most recent foam innovations from the company, and the Nike React Hyperdunk 2017 Flyknit is among the very first shoes to use it. Its creators envisioned it to be both light and durable, which, by the way, are descriptions that usually can’t be used together to describe foam. The technology went through 2000 hours of basketball testing, which only proved the technology’s ability to provide a stable, springy, and sustainable response. Traction. The outsole of the Nike React Hyperdunk 2017 Flyknit has a traction pattern that is based on data collected and analyzed in Nike’s research labs. This traction pattern maps and supports the foot’s pressure points, ensuring a much more efficient and stable ride for the wearer. Length and Width. The Nike React Hyperdunk 2017 Flyknit comes in the standard width, so some reviewers recommend that wide-footers go at least half a size larger. Lockdown. As if the sock-like fit of the Flyknit is not enough, this shoe also has a lacing system that wearers can use to adjust to the desired snugness. There are also Flywire cables that are integrated into the design of the shoe to provide a more secure hold. Debuting in 2012, the Flyknit is the fruit of an ambitious effort to achieve durability and sock-like comfort. Nike’s engineers and programmers took four years to perfect the technology. This technology’s inclusion in the design of the Nike React Hyperdunk 2017 Flyknit makes possible a lightweight and comfortable pair of kicks that can withstand the harsh beatings on the court. The high-top design of the Nike React Hyperdunk 2017 Flyknit provides high levels of ankle support, making it an ideal partner for jumpings and landings. It features a largely monochromatic colorway that is easy to the eye. The sock-like fit of the Flyknit upper gives the shoe a neat silhouette. As a prominent reminder of the quality that it offers, the shoe sports an embroidered Swoosh on its lateral side. The Nike React Hyperdunk 2017 Flyknit is available in tonal hues. Part of the ‘Ghosting’ pack, the Virgil Abloh X Nike React Hyperdunk features a translucent upper. “Abloh was inspired by the cutting-edge cushioning innovations of Breaking2’s Nike Zoom Vaporfly Elite running shoe and basketball’s React Hyperdunk 2017, and decided to introduce an evolution of the reveal called “GHOSTING” using translucent uppers,” Nike said.